Sometimes, cooking can a complex process especially when the ingredients required for the dish are not ready. The kitchen is a place where things should be as simple as possible. The commodities for cooking need to be very accessible. This can be achieved by proper design of the kitchen and having just the right amount of utensils in the kitchen. We at Avani keep our customers in mind while designing any of our products. 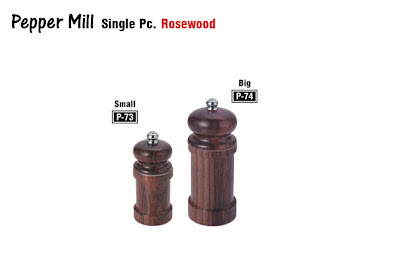 One such example is the pepper mill. A food is never complete without love and salt. The next most important thing is the pepper. Unless if it’s a sweet dish or a dessert. Pepper gives the food spicy taste and makes it a whole lot better. As it is so important ingredient it needs to be stored properly. That’s why we have come up with an attractive and artistic pepper mill design which will not only preserve the pepper seeds but also give your kitchen the modern look. It will also blend with most of the other utensils that preoccupy the kitchen. Its transparent and clear glass design makes it even more attractive. It is very easy to use kind of stuff. The glass is strong and can handle minor impacts. It gives clear view of the quantity of the pepper left. If the pepper gets over it can easily be opened and refilled. The ease and the design of the pepper mill have really made it one of the most favorite buys from our products. The pepper mill always adds sparkle in your kitchen and makes your work hassle free. There are many appliances, cabinets, desks and tables in our houses. When they are placed at some place we don’t tend to move them for quite long times. What happens is that they remain for the same position and then spoil the tiles and flooring over a course of time. This leaves stains and dirt under the tables and cabinets. People try placing paper, clothes etc under the base to avoid such problems. But more often than not they don’t help. This is what prompted us to come up with a solution to solve all problems. The solution that we found is termed as “keep up”. The keep up is a kind of stand that be placed under any of the above mentioned things. This will prevent your tiles from getting spoilt and also will not leave any stains. The keep up raises the things to a height of about 3 inches from the ground. This helps you to clean the space under the desks and also maintain the cleanliness. Some of the refrigerators have thin bases and some of the desks have big bases. The keep up is made of a universal size. No matter what the size of the base is you can still use it to keep it under the base. The keep up is made of plastic which is about 3 inches in height. It is strong enough and durable and doesn’t even break under the heavy load of the fully loaded refrigerator or a fully loaded cabinet of cupboard. The keep up not only helps in raising the cabinets to a height but also gives a new look to the existing equipments. Also you get this product in variety of colors and you can suit according to your choice. This is also very light weight and hence can be easily carried from one room to another. The keep up has many advantages of its own. When you raise the cabinet you tend to make space under it. You can place some normal stuff under it and also clean it as per your convenience. It gives a new look to the cabinets as well. Keep up really keeps up to the expectations of the users. We all have a variety of tools and utensils in your kitchen. We have peelers for peeling the vegetables and fruits; we have a chipper for making chips; we have a slicer for slicing vegetables and fruits. On first thought it all seems sensible, but on second thoughts we ask do we really need so many things in our kitchen? The answer is simple NO. Why do we stuff our kitchen with so many utensils when we need not do so? The answer to this question is that we don’t have to. We have designed a one stop solution for the above mentioned activities. This is what we called the scrapper. 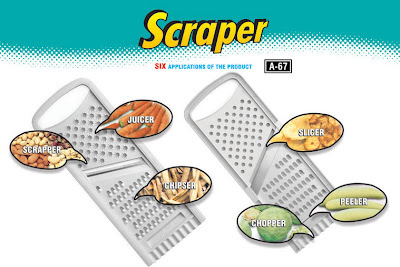 The scrapper is a one stop solution to most of the activities like peeling, chipper, slicing, etc. The scrapper is a very important tool to do all the activities said before. It is a good replacement for as much as six different tools which are-scrapper, chipper, slicer, chopper and peeler. The scrapper can be used for scrapping dry fruits. The juicer can be used to cut carrots for extracting juice. The chipper and slicer can be used to make chips. The chopper can be used to cut fruits and the peeler can be used to peel the skin of different veggies. The scrapper is made of Plastic and is very light weighing tool. The design is such that you can use it on both sides. That is a very nice quality about it, not even a single inch of space is wasted on the scrapper. On one side you have holes which are designed to act as scrapper, juicer and chipper. In the middle there is a slicer. In the bottom part there is a peeler and below it is the chopper. There is a big space at the top which acts as a handle while working with it and can be used to hang when not in use. The multipurpose scrapper is an innovative yet very efficient tool and is a must in every kitchen. It not only scores high on the looks but also the functionality and the multi utility aspects of the scrapper. Also the dimensions are such that it will fit into very small spaces with utmost ease. The experience of using the scrapper will be new for sure. The process of cooking requires a lot of dedication and concentration. One single mistake can completely spoil the dish and make it inconsumable. But the dangers are not always so grave. Many simple mistakes can also be rectified even after the dish is fully prepared. For example you can add salt if it is found to be less, you can add chili powder if you don’t find it spicy enough and so on. We designed a product tailor made for such instances. 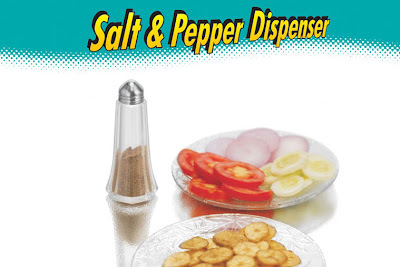 The product is a very innovative, attractive and beautiful salt and pepper dispenser. A food is never complete without love and salt. The next most important thing is the pepper. Unless if it’s a sweet dish or a dessert. Pepper gives the food spicy taste and makes it a whole lot better. The taste is and individual attribute and cannot be deduced as a common preference. One person might like the dish to be less spicy while the other might want it spicier. Most of the times the dishes are prepared with bare minimum requirements and the person eating it might make it good enough. The salt and pepper dispenser is small and very artistic. It will not only decorate your dining table but also serve it purpose well. Its transparent and clear glass design makes it even more attractive. It is very easy to use kind of stuff. The plastic is strong and can handle minor impacts. It gives clear view of the quantity of the salt or pepper left. If the stuff gets over it can easily be opened and refilled. The dispensers can be used to serve variety of products like garam masala, chili powder and chat masala. The design whole look of the dispenser is very eye catching. The ease and the design of the dispenser have really made it one of the most favorite buys from our products. The salt and pepper dispenser always adds sparkle in your kitchen and makes your work hassle free. Eggs and meat Is one of the most common non vegetarian diet that we have in our day to day life. From that eggs are more important part of our diet as it is very healthy and high in proteins. We do have eggs for breakfast, lunch and dinner. Most people prefer to have eggs for breakfast. So we have introduced a brand new innovative product called egg slicer which is used to slice boiled eggs. It helps in serving your breakfast is a beautiful manner and make it very attractive to the person to whom it is served. Generally the breakfast is served in the old fashioned style where you boil the eggs and serve it in the plate. That is not appealing to the person to whom it is served. 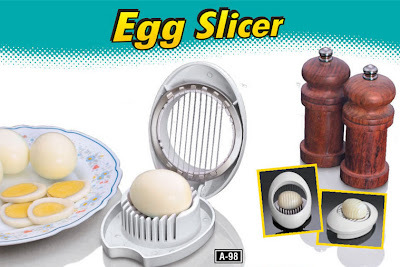 Egg slicer changes the whole scenario. The egg slicer cuts the egg in equal parts and looks elegant in the plate. The egg slicer is made of ABS Plastics and stainless steel wire. The stainless steel wire is corrosion resistant. The wires are very thin. The egg slicer is soap shaped box which can be opened from the middle. The egg is to be placed in the middle of the case and then the lid is to be closed on the egg. The blades on the lid cut the egg in many thin and small equal parts. The egg slicer case is made of hard plastic. It can also be cleaned very easily under the flowing water or with some dry cloth. It is very compact and occupies very less space. This makes it easy to store and keep in any of the drawers or the utensils shelf. The egg slicer is a small and new tool which can be a part of any modular kitchen. The egg slicer is available in only in rich white color. The ease of use and the effective cutting of the slicer have made it one of the famous buys from our list of products. Its small size and weight makes it easy to carry on picnics and outings. The egg slicer is defiantly a trendy tool to have it in your kitchen. After our successful product called chop cut we bring to u a new, improved and yet innovative product called chop wash. Right from our school days the most common food etiquettes taught to us were-wash the food and hands before eating. That’s exactly what our focus was while designing chop wash. Many a times we need some vegetables in our food on urgent basis. They need to be chopped and washed quickly so that it can be added in the dish that we are preparing. The chop wash is the perfect option for such situations. The chop wash comes with a design very similar to the chop cut with very interesting innovations. Using chop wash can help u accomplish two tasks simultaneously. The tasks like chopping the vegetables and washing them under the flowing. This utensil make your life very easy in the kitchen works and minimizes the efforts required to make your favorite dish. With the help of chop wash you can cut and variety of vegetables like ladies fingers, beans, etc. You can cut them with the blade and then collect it in the basket attached to the dish and wash them with utmost ease. 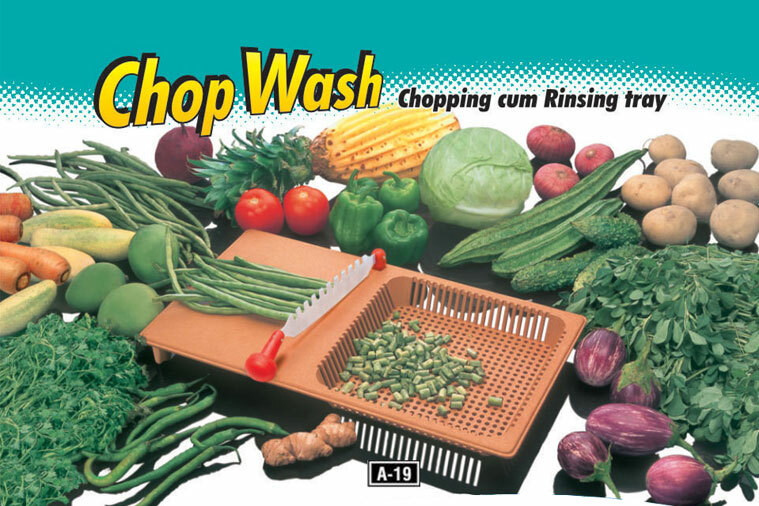 The chop wash is made with Plastic and the blades are made with stainless steel which is corrosion free. The chop wash is a flat board made of Plastic and mounted on it is the steel blade. Half of this board is made into a basket to collect the cut vegetables. The basket is like a net which easily allows the water to pass out along with the impurities in the vegetables. The blade can be rotated 360 degrees. The blade is a two sided blade and anyone side can be used based on the requirement. The other side of blade is a U shaped edge which is very similar to the chop cut. The blade comes with the plastic handle which is very easy and convenient to hold. The chop wash is a little bigger in size than its counterpart- the chop cut. But it serves far more than chop cut. It easily fits into the kitchen desks and also need very less space as compared to the traditional cutting tools. The simple design and mild brown color gives it a very sophisticated look and adds beauty to your kitchen wares. It is defiantly one of the kitchen wares that you wouldn’t want to miss out. The people who spend most of their time in kitchen are always involved in tasks such as chopping, cutting, etc. Most of the chopping and cutting is done on steel plates or wooden boards. Steel plates are often not recommended for cutting purposes and wooden boards are bit expensive. Our latest product will free you from both the above mentioned worries. We present you with fiber cutting boards which will be just the perfect replacement for the traditional cutting boards. 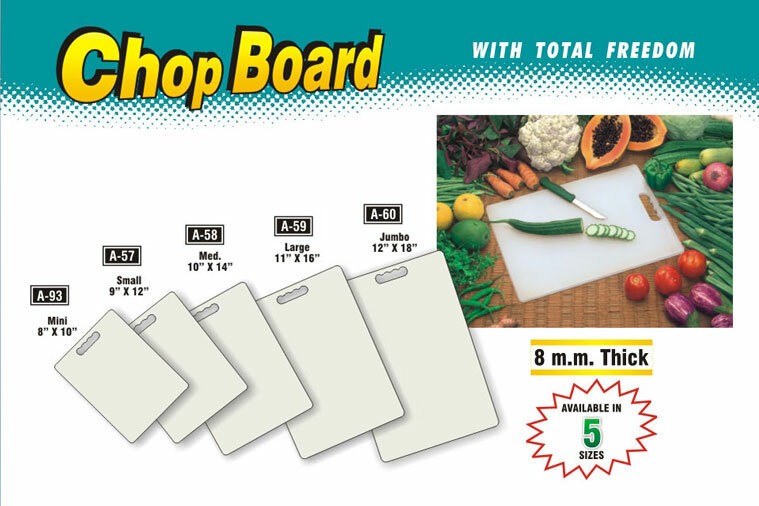 The cutting boards come in five different sizes and you can choose as per your requirement. The five sizes are termed as mini, small, medium, big and jumbo. The normal chop boards that we get from the market are of very inferior quality and are not designed keeping the user in mind. Our chopper boards are very sleek in design and adaptive to the look of any kitchen. The materials used to make these boards are made of flexible plastic and also can easily resist any blade marks. It is also easily washable and hence scores high on the hygiene front as well. The chop boards are white in color which makes it look very elegant and stylish. As the boards are very thin the can easily be placed into any of the drawer or any other compact place. As mentioned earlier the board comes in five different sizes and each has advantages of its own. If you are cutting small vegetables like onions, potatoes then the small size boards will be helpful. If you are planning to cut many vegetables then the big size is recommended and so on. With our constant market study and kitchen expertise we try to come up with new products now and then. These efforts of ours have been giving very fruitful results. The chop Board is not only giving smiles to the users but also makes them enjoy their cooking. We are group of companies which create unmatched quality kitchenware products. Powered by Blogger.